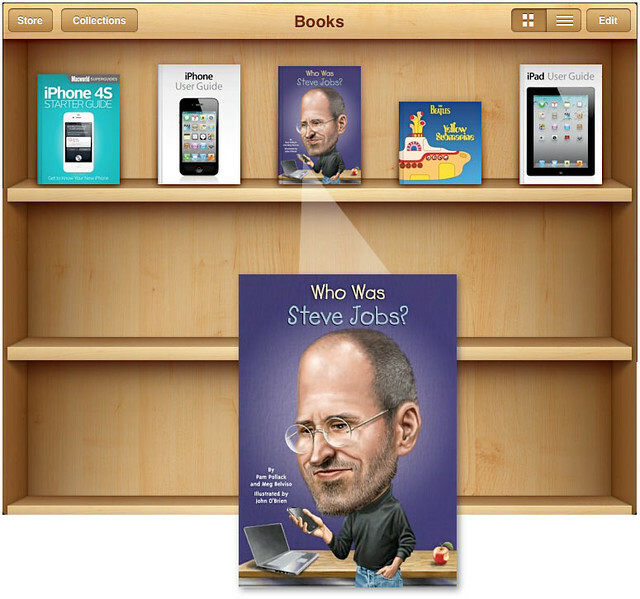 In order for third graders to truly understand the genius of Steve Jobs, it takes rugged illustrations and a book cover featuring Apple's Co-founder sporting a ginormous cranium. That's because smart people have really big brains and carry an iPhone. Although "Who Was Steve Jobs?" is a children's book aimed at 3rd to 6th graders — the content under cover does a stellar job detailing the history of Jobs, but does not fail to cover facts on Steve Wozniak, including his 1981 plane crash that led to an extended leave of absence from Apple. While this book by Pam Pollack and Meg Belviso is meant for kids, I'm certain serious Macheads will discover "Who Was Steve Jobs?" to be a collectible gift that keeps on giving. I was surprised to find the storytelling digging into more obscure details on Jobs' life which includes girlfriend Chrisann Brennan, sister mona Simpson and even an illustration and description of Jobs uttering his last words from his death bed. "According to Steve's sister Mona Simpson, a few hours before he died, Steve looked at his sister Patti, then his children, and then Laurene. He said: "Oh wow. Oh wow. Oh wow." Those were the last words he spoke." The book even manages to highlight the makeshift memorials launched by mourning fans at Apple store locations around the world when Jobs died on October 5, 2011. With two feature films about Jobs currently in production, I would expect even more books to hit the shelves as long as there's a boatload of money to made from his profound legacy. The iBook version is available for download now — priced at $4.99 which is the same for paperback, Kindle and Nook editions. While the grand legacy of Eastman Kodak rapidly fades out of view — Santa Barbara designer Roberto Altieri is busy re-purposing vintage photo cameras to serve a more useful role in the modern digital age. His work is driven by a longtime passion for photography and love for exploring old film cameras. This classic Kodak Brownie Bull's-Eye camera originally introduced in 1954 — has been reimagined to serve as a functional iPhone charging dock. Each upcycled camera is handcrafted and beyond repair for photography purposes before it's converted to become iPhone-friendly. It's obvious that the work produced by Laboratorio Altieri requires a zeal for vintage beauty along with an inspired imagination for redesign. Expect to pay $99 for this timeless touch of 1950's photography. Extreme feelings of childlike wonder come free upon delivery. After more than 20 pedestrians have been hit by cars so far this year in Bergen County — the city of Fort Lee, New Jersey has begun cracking down on texting while walking by issuing $85 tickets to offenders they're calling “dangerous walkers”. A moniker that sounds like it came straight out of a zombie movie. Fort Lee police say they've issued nearly 120 tickets in just six weeks - slapping an $85 jaywalking ticket on any pedestrian who is caught texting while walking. “It’s a big distraction. Pedestrians aren’t watching where they are going and they are not aware,” said Thomas Ripoli, chief of the Fort Lee Police Department. A study conducted by two professors at New York's Stony Brook University found that texters are 60 percent more likely to veer off line than non-texters. The hefty $85 fine is designed to send a strong message to “dangerous walkers” while ultimately protecting a mindless glut of texting zombies who are just too dumb to protect themselves. While the crackdown is another way for Big Brother to strip citizens of their civil liberties in the land of the free — the N.J. ban, that could be adopted by more U.S. cities is ushering in a brand new meaning to “pay-as-you-go” mobile plans. According to a Nielsen report, that growth marks an increase of 38 percent over last year. Which makes issuing fines on “dangerous walkers” a lucrative business model for cities battling budget shortfalls. It should really be called “taxing while walking” — which I find far more dangerous to the public at large. Ashton Kutcher was spotted on the way to the Jobs biopic movie set in Los Angeles on Friday dressed in classic Steve Jobs wardrobe — wearing a black turtleneck, jeans and sneakers. The first iKutcher photos posted by TMZ reveal the 34-year-old "Two and a Half Men" star looking convincingly Jobs-like in his role as the complex hippie billionaire for "Jobs: Get Inspired." The indie film directed by Joshua Michael Stern, is expected to be released sometime in the fourth quarter of 2012. Are iPhone Business Cards The Next Big Thing? These iPhone Business cards imagined by web designer Frederic Tourrou are causing quite a mixed reaction around the interwebs since they first surfaced on Thursday. The popular consensus from many vocal critics insist that the addition of rounded corners is essential to getting the design right. Advice that Tourrou has already acted on. While most commenter's on The Fancy seem to like the idea — some have not been kind to this Beasty Design original. "Pretty cool.....except he looks like a murderer.... At least wear something better than that if your headline is Hire Me" one commenter wrote. Another commenter who goes by the handle skyhookv3 wrote "Death to the User of those." It's obvious that the lesson here is to never post any of your original design ideas online or you might end up with your work splattered across the globe for millions of people to see. It just might get you noticed — by both the lovers and the haters. A risk worth taking in my opinion. Some chose not to be so brutal when commenting on Frederic's insanely clever brainstorm. "Luv it, very smart. This card leaves an impression, which is the whole idea of advertisements. The buyer will surely pick up the card time and time again!" Like it or not — I can see iPhone business cards quickly becoming the next big thing. What if the iconic Instagram logo was made into a real camera? That curiosity is the driving inspiration behind the Socialmatic — a concept camera designed by ADR Studio to print Instagram photos on-the-go. I would expect the Socialmatic to become instant Hipster wear practically overnight. It comes fully loaded with 16GB of storage, optical zoom, 4:3 touchscreen, WiFi, Bluetooth, LED flash and an internal printer that let's you peel off insta-prints on a whim and stick them around like a post-it note. The clever size of this vintage meets digital point-and-shoot is perfect for wearing as an Instagram necklace when you're not snapping away at random homeless people, swing sets or distressed buildings. But who would actually buy this thing anyway? Socialmatic — for everyone who thinks digital is just not amazing enough.